Top-Line Revenue – In terms of top-line revenue, analysts expected that ADBE would generate a total of $1.34 billion in the quarter. However, the company earned $1.38 billion in the quarter, not only beating expectations, but showing strong year over year growth from $1.11 billion in the same quarter a year before. 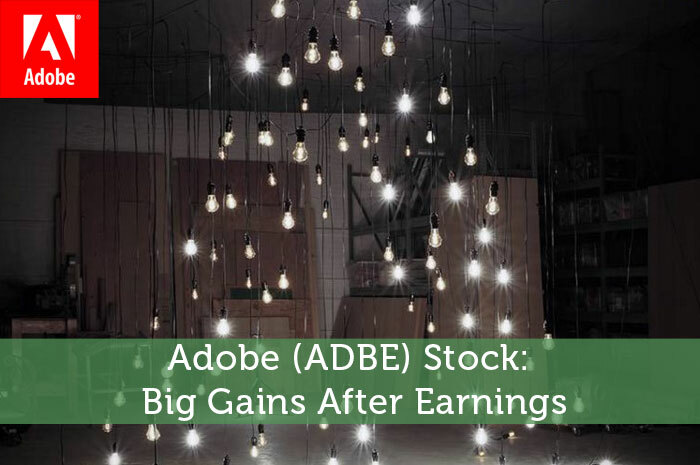 Earnings Per Share – When it comes to earnings per share, ADBE did incredibly well. In the quarter, analysts expected that Adobe would generate earnings in the amount of $0.61 per share. However, the company was actually able to generate earnings in the amount of $0.66 per share; also showing exceptional year over year growth in this figure from $0.44 per share in the same quarter a year prior. Key Stats – Adobe’s digital media segment is doing incredibly well. After 33% year over year growth, it has hit a record of $932 million for the quarter. Creative revenue is also headed in the positive direction, growing 44% year over year to a record of $733 million earned in the quarter. As investors, we know that the news moves the market. Any time there is positive news with regard to a publicly traded company, we can expect to see a positive reaction in the market as a result. Adversely, when there is negative news, we can expect to see losses in the market. In this particular case, the news surrounding ADBE is overwhelmingly positive. Not only did the company blow away earnings and revenue, they broke records with regard to different segments within the company. So naturally, ADBE is having a wonderful time in the market at the moment. Currently (8:19), Adobe is trading at $96.30 per share after a gain of 7.05% or $6.34 per share thus far today. Moving forward, I have an overwhelmingly bullish opinion with regard to what I expect to see from ADBE. First and foremost, the company has proven a couple of things with the most recent earnings report. Not only are they capable of growth, they are capable of producing strong net gains. The company’s core focus on sales has driven incredible results in the first quarter, and set the stage for a great year ahead. With a great management team, great products, and a clear plan for success, I could imagine a situation where ADBE wouldn’t be able to grow in the market. Where do you think ADBE is headed and why? Let us know your opinion in the comments below!